Summer is here, which means an increase in certain diseases and illnesses like allergies, food poisoning and hives. There are also a number of life-threatening illnesses to look out for this summer. 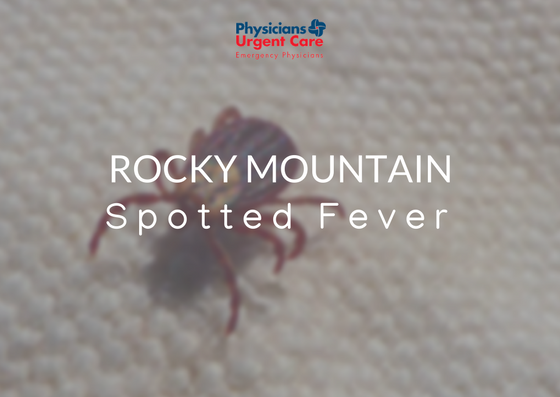 One of those illnesses is Rocky Mountain spotted fever. Why is Rocky Mountain spotted fever such a huge concern this summer? Rocky Mountain spotted fever is an illness caused by a bite from a tick infected with a particular bacteria known as Rickettsia rickettsii. The majority of cases of RMSF occur during the summertime, but cases have been reported in the spring, fall and winter months, as well. Where Does Rocky Mountain Spotted Fever Occur? In the United States, more than 60% of reported cases of Rocky Mountain spotted fever occur in just five states: Tennessee, North Carolina, Oklahoma, Missouri and Arkansas. Cases of Rocky Mountain Spotted Fever have even been reported in Canada and South America. The tick species that carry RMSF are the American dog tick, the Rocky Mountain wood tick, and the brown dog tick. RMSF is difficult to diagnose. Symptoms may not materialize until nearly two weeks after infection. The most tell-tale sign of RMSF is the notorious rash. Typically, the rash appears around 3 days after being infected. It can appear as red splotches or red pin-prick dots. It often appears first on the wrists, forearms, legs and ankles. The rash may eventually spread to the palms or trunk. Late-stage symptoms of RMSF can include conjunctivitis, joint pain, and severe stomach pain. Why is Rocky Mountain Spotted Fever Dangerous? RMSF poses several health risks. The infection attacks the cells lining the body’s blood vessels which can lead to hemorrhaging and life-threateningly low blood pressure. If left untreated, the infection can cause kidney damage, brain inflammation, jaundice and liver injury. The current treatment of choice for RMSF is doxycycline. When treated within 5 days of infection, most individuals recover completely. How Can You Avoid Rocky Mountain Spotted Fever? There is currently no vaccine available for this infection. The best way to prevent infection is by avoiding tick bites. Ticks live in grassy, wooded areas. They are also found on many animals. If you garden, camp or hike regularly, you’re more likely to come in contact with ticks. Check yourself for ticks each time you go outside. Check your pets for ticks each day. Treat your clothing and camping gear with anti-parasite creams like permethrin (Nix) to reduce the risk of tick bites while you’re outside. After going outside, remove all clothing and tumble dry your clothes on high heat. Shower immediately. Check your body carefully for ticks, especially areas that you can’t see. Use a hand-held mirror to check your back or have a family member help you check. If you find a tick on your body, remove it immediately. Grasp the tick firmly with tweezers and remove its entire body by pulling straight out. Pay attention to any signs of illness that follow in the days after you remove the tick from your body. Visit a healthcare provider immediately if you experience a rash or a fever. If you’re experiencing tick-related illness, Physicians Urgent Care is here to help. Berry Farms – Located off the Goose Creek Bypass in the Berry Farms Town Center, just down from Publix. 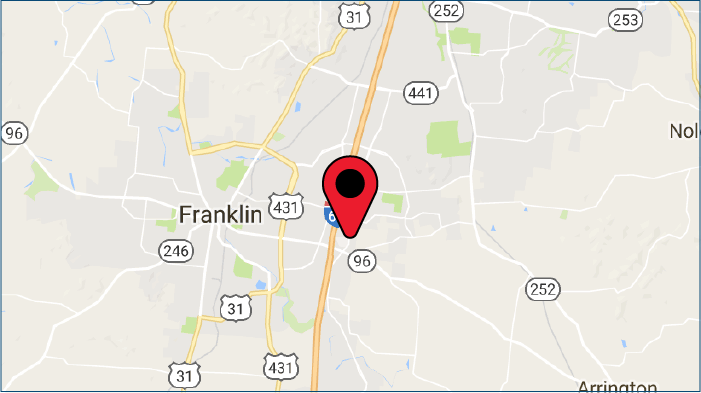 Franklin – On the corner of Route 96 & Carothers Parkway in front of Williamson County Medical Center. Summer is here! Finally, you can enjoy long hours of sunlight, green grass, lush trees, swimming and BBQs. Unfortunately, it’s almost impossible to enjoy anything if you’re dealing with a pesky summer illness–like hives. Hives are a common (and annoying) health condition that many of us find perplexing. What are they? What causes them? Why do some people get them and others don’t? 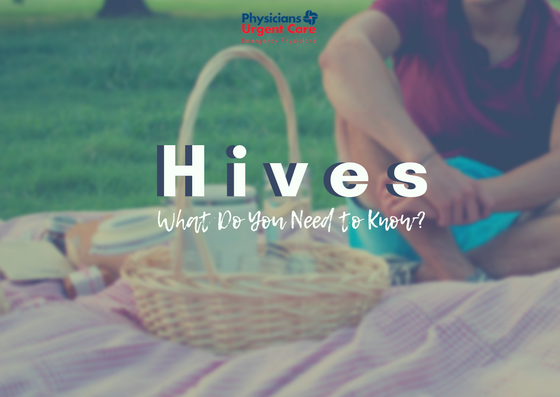 Keep reading for some key information about hives (also known as urticaria). Hives–or urticaria–is a skin reaction that results in raised, red welts or bumps. These welts can often be itchy and irritated. Sometimes, they burn or sting. Urticaria can appear as a single welt or several welts in a patch, forming what is known as a plaque. These itchy welts can last anywhere from 6-12 hours, but they often disappear sooner. Believe it or not, there is a form of hives that occurs as a response to a body’s own sweat. This condition, cholinergic urticaria, is sometimes known as heat bumps. Cholinergic urticaria occurs as a reaction to the immunoglobulin released in sweat during exercise or a raise in body temperature. Because we spend more time outside in the heat during summer, cases of heat-related urticaria are more common during the summer months. Urticaria can be caused by more than sweating, however. Many people have allergies to shellfish, and break out in itchy, red welts if they consume shrimp, crab, oysters, lobster or scallops. Many of us consume more seafood during the summer, especially if we go on vacation to tropical or beach locales. It’s important to be aware of shellfish ingredients at any new restaurant, picnic or cookout, no matter the time of year. Talk to your doctor about underlying health conditions that may be causing your hive outbreak if you can’t figure out a culprit. Many people think urticaria can only appear on the face, neck and chest. In fact, it can appear anywhere on the body. Cases of urticaria have been reported on the feet, hands, legs and back. It’s important to be aware of your hives outbreak, even if the welts pop up on unusual parts of the body. When Should You See A Doctor About Your Hives? Urticaria generally subsides within a few hours and leave no skin abrasions or marks behind. However, you should see a medical professional for urticaria that last more than a few days. Similarly, hives that appear as the result of an allergic reaction should be monitored closely. Visit your doctor immediately if you notice your breathing becomeing heavier or labored after a hives breakout. Our four Middle Tennessee Physicians Urgent Care locations are open seven days a week to care for you should you experience any summertime illness. These Are The Most Common Summer Health Problems. Summer is right around the bend, bringing summer sports, vacations, cookouts, family holidays–and plenty of seasonal illnesses and health concerns. Even though winter gets the worst rap for being the “season of illness,” summer also has its fair share of sickness floating around. 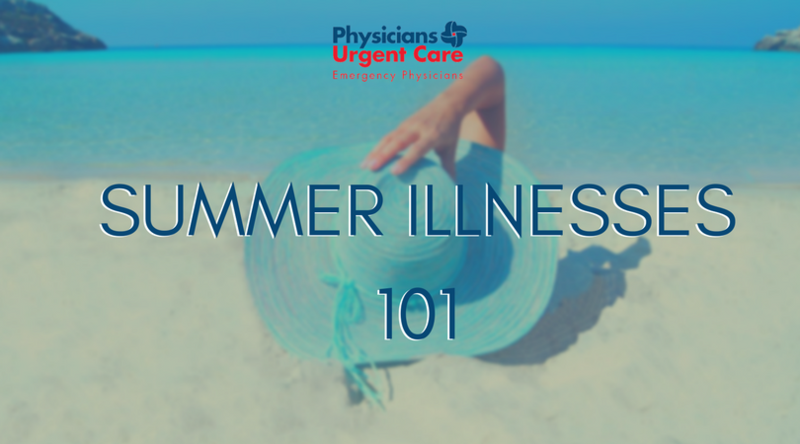 Today, we’re looking at a few of the most common summer illnesses so you can prepare for the hot months before they arrive. Tennessee is home to several species of insect and arachnid that show up when the weather gets warm. Many of those insects sting or bite. Others can actually carry diseases. Ticks are a big threat during the summer months, with their activity peaking from May – July. In Tennessee, there are over 15 species of tick, with the lone star tick, brown dog tick and the American dog tick most common. These arachnids carry several dangerous diseases, including Lyme disease, Erlichiosis, Southern Tick-Associated Rash Illness, and most alarmingly, Rocky Mountain Spotted Fever. The most common signs of these infections are a fever, body aches or a rash after a tick bite, and you should seek medical attention immediately should you experience them. Mosquitoes are one of the most annoying summer insects. They can also carry bacteria and viruses that cause illnesses like West Nile Virus, dengue fever and La Crosse encephalitis. To avoid being bitten by mosquitoes, it’s important to wear light colored clothes and wear mosquito-repellent if you can. You should also avoid going outside during peak mosquito hours (like dawn and dusk when wind is the stillest). Other insects and arachnids are also more active–and likely to bite or sting–during the summer. Bees, wasps, hornets, yellow jackets, bed bugs, ants and a variety of spiders can be summer nuisances that bite and sting. Even if you don’t have a bite-related allergy, it’s important to seek medical attention for any bites that are suspicious-looking or feel irritated for extended periods of time. Summers in Tennessee are notoriously hot. Average temperatures in July and August hover around 90 degrees Fahrenheit, making it dangerous to be outdoors for long periods of time. One of the effects of prolonged exposure to a heat index of 90 degrees Fahrenheit or hotter is the risk of heat exhaustion. Heat exhaustion occurs when a person’s internal temperature reaches around 100 degrees Fahrenheit. Hot weather, coupled with dehydration, can lead to heat exhaustion and, eventually, heatstroke. While heat exhaustion can be reversed by getting out of the heat, drinking fluids, removing tight or insulating clothing and resting, heatstroke is much more serious. Heatstroke occurs when your body temperature soars to around 104-106 degrees Fahrenheit, causing confusion, slurred speech, agitation, headache, and rapid breathing and pulse. Heatstroke requires emergency medical attention. So how can you avoid heat exhaustion and heat stroke? First, always wear loose-fitting, light-colored clothing if you’re going to be outside. Try to avoid insulating knits like polyester, nylon or wool. Linen, cotton, jersey and seersucker are breathable, lightweight alternatives that will help keep you cool. You should also drink extra fluids. If you’re going to be active, try to increase your water intake significantly. If you’re spending time outside, it’s important to consume water every hour. Food-borne illnesses increase during the summer months for two main reasons. First, bacteria (including food-borne bacteria) thrive in warm, moist temperatures–like the hot, humid summers in Tennessee. Secondly, we are more likely to cook outside during the summer, where temperature-controlled refrigeration and cleaning tools are less common. Cooking outside also makes it harder for us to wash our hands–a vital part of cutting down on germs. This allows bacteria to proliferate more easily and make its way into our food. To cut down on the likelihood of food poisoning, it’s important to wash your hands and clean cooking surfaces often during food prep. Separate meats and fish from other foods, and never mix raw foods or their juices with cooked foods. Have you ever spent a day outdoors in the middle of July? Did you find that the skin on your shoulders, scalp, and knees was red, sensitive and hot to the touch afterwards? Then you’re probably familiar with the unique misery of a sunburn. Earth is closest to the sun during summertime, making the sun’s rays hotter and more likely to burn you. This is especially true between 10:00 AM and 4:00 PM. Individuals with pale, freckled skin are more likely to experience serious burns than individuals with darker skin. However, all individuals should be careful to regularly apply SPF, wear hats and sunglasses outdoors and try to minimize sun exposure during the hottest part of the day. Most sunburns improve on their own after a few days. You should seek medical attention for sunburns that are accompanied by extensive blistering, headaches and fever or intense pain. Have more questions about common health issues? Check our blog regularly for updates. Our four Middle Tennessee Physicians Urgent Care locations are open seven days a week to care for you should you experience any summertime illness! Winter is here, and for many of us, it’s a time of endless colds, coughing, and flu-like misery. We’ve covered the flu in detail here on our blog, but this week we decided to tackle some easy ways to keep your immune system strong. Continued sleep loss takes a toll on your immune system and leaves you more susceptible to illness. Studies show that lack of adequate sleep or lack of high-quality sleep can negatively impact your body’s ability to fight illness. In fact, during a good night’s sleep, your body produces proteins called cytokines that you need when you have an illness or infection. If you aren’t sleeping enough, you can’t produce these important proteins. Shoot for 7-8 hours of sleep per night. Stress is detrimental to your immune system. In study after study, stress is linked to infection and illness. Over time, chronic stress suppresses the body’s immune system and has even been linked to several serious illnesses. It’s easy to talk about the importance of stress control. It’s another thing to actually do it. Most researchers agree that regular exercise has a variety of stress-relieving properties. Exercise improves cardiovascular performance. It also releases endorphins that help control the stress response. It’s also important to indulge in your own personal stress-relief. Maybe you enjoy crafting, working on your car or gardening. Whatever your hobby is, it’s important to make time for it. 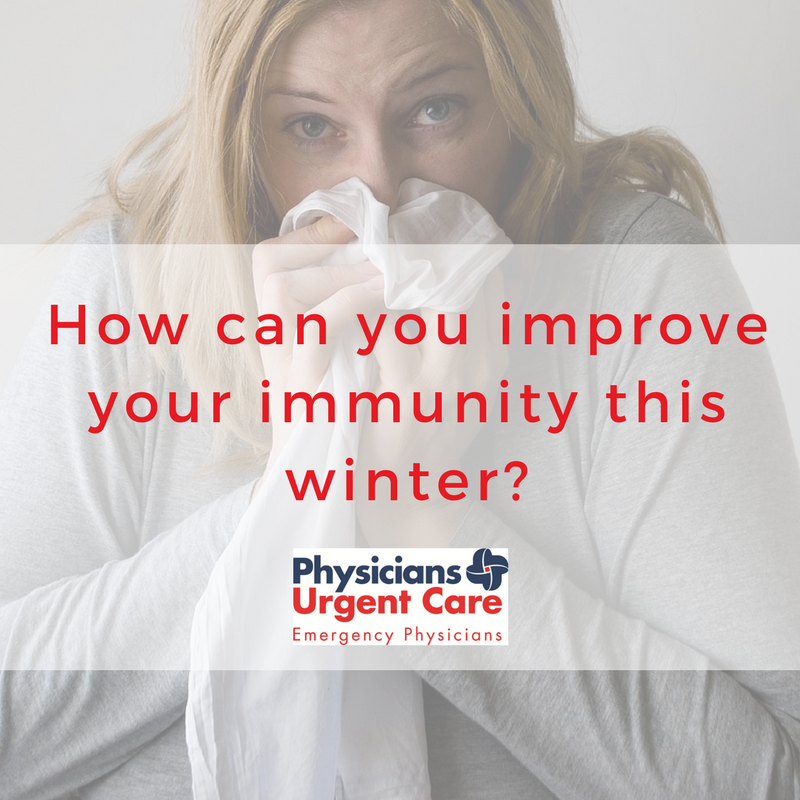 Winter time sees an uptick in colds and other illnesses because we’re spending more time indoors–where germs are abundant. You might not be able to avoid staying inside more when it’s cold, but you can control how often you wash your hands. Make sure you’re washing your hands with antibacterial soap regularly throughout the day. This is especially important if you work in a school or office in close proximity to other people. If you can’t wash your hands with soap and water regularly, invest in an antibacterial hand sanitizer that is at least 60% alcohol. This will help you cut down on the amount of germs in your vicinity throughout the day. If you do find yourself suffering from a seasonal illness or infection, it’s important to have a trusted urgent care clinic nearby. Physicians Urgent Care is proud to be a trusted provider of urgent care services for the Nashville area and beyond. 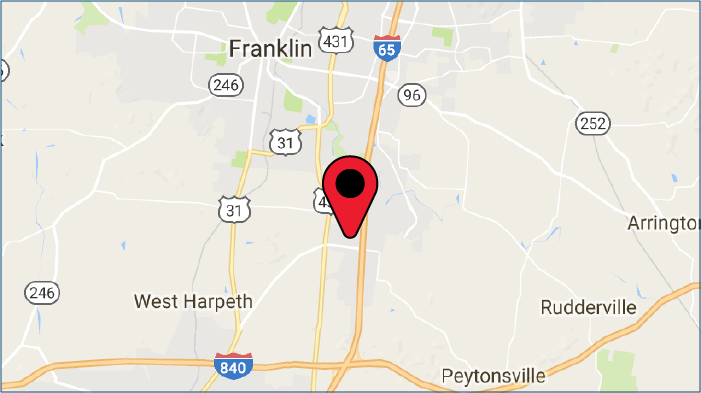 Find a Physicians Urgent Care location near you or contact us at 615-472-1550 to learn more about our services. This year’s flu season is gearing up to be one of the worst, according to statistics from the Centers for Disease Control and the Tennessee Department of Health. 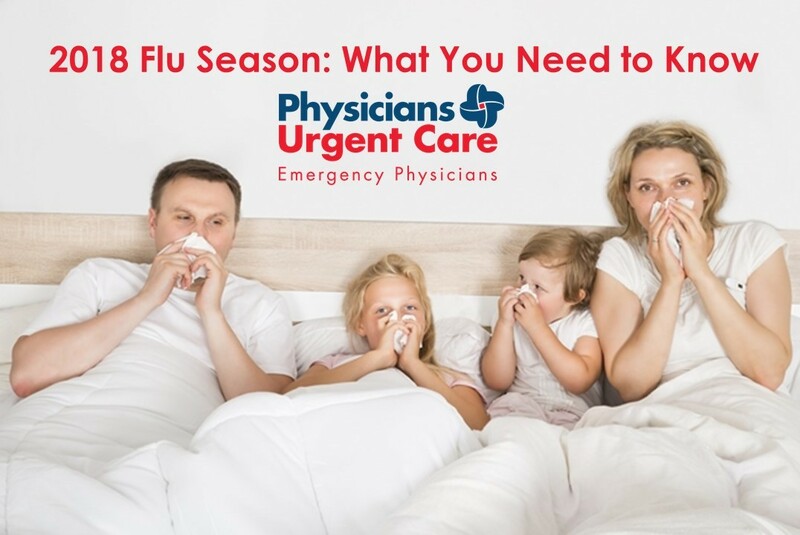 All of our Middle Tennessee Physicians Urgent Care clinics have seen many positive flu tests in the last few weeks, and we wanted to share some helpful information with you about how this year’s flu season is unique. 1. A bad flu season for Australia means we will likely have a bad flu season. We have already seen that flu is bad from the number of sick patients coming to our clinics, however officials tell us it may continue to get worse. Health officials use information from Australia’s flu season, which runs from May to October, to predict trends for the American flu season, which runs from October until May. Australia had a record high number of confirmed flu cases for their season, and the H3N2 influenza A subtype that was most prevalent was especially nasty with more severe symptoms. Flu season in the US peaks from December to February, so we are just now hitting the worst of the season. 2. People die every year from the flu, and this year is no different. Tennessee has already experienced four flu-related deaths this flu season, including children and a pregnant woman. Children under 5 and the elderly are most at risk of death from the flu, however it is recommended that everyone who is able get a flu shot. Remember it takes about two weeks for your body to build up immunity to the virus after vaccination, so if you haven’t gotten a flu shot, get one today! 3. This year’s flu shot is likely to be less effective than usual, but you should still get one. We won’t know how effective the shot is until the flu season is over, but Australia’s shot was found to be less effective than usual. Even though the vaccine is not a guaranteed protection from all flu-like illnesses, it does offer some protection. Studies have also found that the flu shot will lessen the course and severity of the disease should you get it and could reduce the risk of death in children who get the flu. 4. Basic health and hand hygiene really make a difference in preventing the spread of the flu. Simple things like staying away from sick people, avoiding touching your face, washing your hands, and cleaning commonly touched surfaces like phones, grocery carts and door handles really help to reduce the spread of germs. If you are sick with flu, stay home from work or school to prevent spreading flu to others. You can purchase masks from any local pharmacy if someone in your home has the flu. The most common symptoms of this year’s flu are moderate-to-high fever (although not everyone with the flu will run a fever), sore throat, shaking chills, severe muscle or body aches, headache, stuffy and runny nose and profound fatigue. If you experience these symptoms head to one of our four Middle Tennessee Physicians Urgent Care locations to get appropriately diagnosed and treated. Locally owned and operated by ER physicians – we pride ourselves on excellent care, given efficiently! 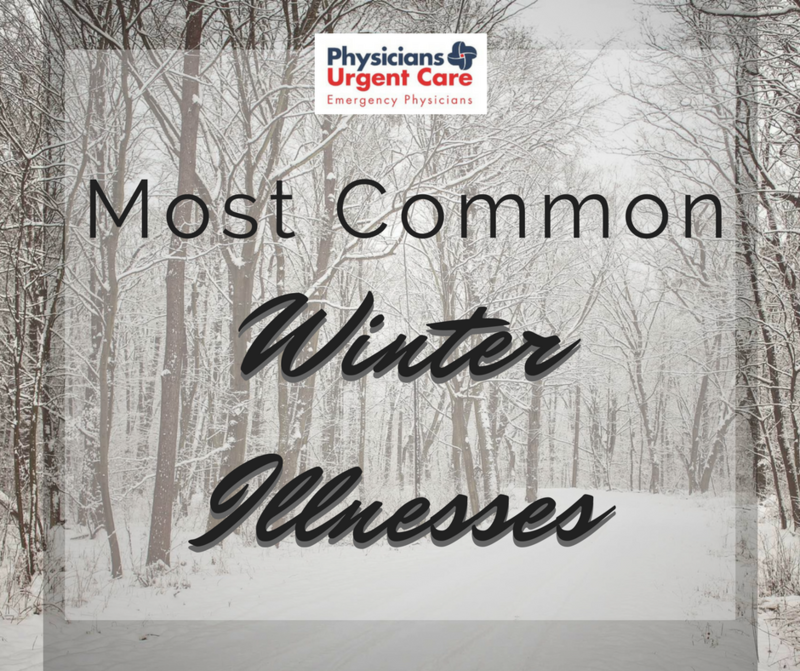 What Are the Most Common Winter Illnesses? The season has arrived–when common winter illnesses rear their heads. From the dreaded flu virus to nagging allergies to the common cold, no office or household is immune. If you’re concerned about sickness this winter, it’s important to steel yourself against the most common viruses and illnesses. Let’s take a look at some of the most common winter illnesses. The influenza virus, commonly known as “the flu”, peaks during the winter months. This is because the virus is more stable in colder temperatures. When the air is cold and dry, the flu virus lasts longer in the atmosphere. It also become easier to transmit from person to person. Easy ways to fight the flu? Get your flu shot, frequently wash your hands and disinfect your home, workspace or other common areas often. Unlike the flu, the common cold is not easier to spread during the winter months. However, people spend more time inside during the winter. This creates more opportunities to pick up the cold germs that are already there. There are over 1 billion common colds reported in the United States each year–so your chances of catching one are pretty high. Some of the easiest ways to steel yourself against common cold germs? Wash your hands often and disinfect your workspace frequently. Also, always use hand sanitizers that are at least 60% alcohol. Otherwise, they won’t kill those pesky cold germs. Norovirus, also known as “winter vomiting bug”, is a highly contagious virus. The virus can be transmitted from person to person easily. It can also be contracted from eating contaminated food or touching a contaminated surface. The virus causes a person’s intestines and stomach to become inflamed. This causes stomach pain, vomiting and diarrhea. For individuals with weakened immune systems or other diseases, contracting the norovirus can be dangerous. It may require an immediate visit to the hospital or a doctor’s office. Some of the risk factors for contracting norovirus? If you work in a childcare center or nursing home, you may be more susceptible. Another risk factor is living in close quarters with several people. You can also catch it by eating in restaurants that have unsanitary conditions. Reduce your risk by washing your hands thoroughly. Additionally, avoid suspicious restaurants or food and stay clear of high-risk locations. Are you worried about catching the flu or another seasonal illness? It’s important to get your flu vaccination as soon as possible. This will reduce your and your family’s risk of contracting the virus. Avoid the nasal spray flu vaccine–only injectable flu vaccine shots are approved by the Centers for Disease Control and Prevention. Physicians Urgent Care is one of middle Tennessee’s leading providers of urgent care services. We are proud to provide flu vaccinations and treatment for winter illnesses like the common cold. 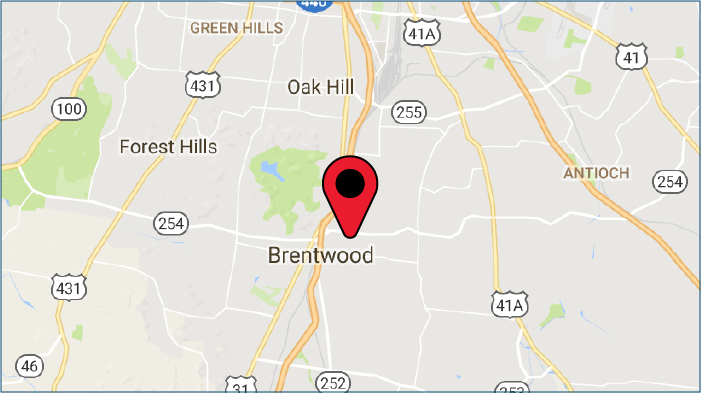 Visit one of our locations or contact us today to learn more. Does that cold seem to have a grip on you that you’re just not able to shake? You’ve taken a ton of vitamin C, drank a river of orange juice, and you still have that cough and sore throat? Feeling feverish? Hurts to breathe? As for energy, forget it. That went out the window a long time ago, right? Maybe you don’t have a cold. Maybe you have pneumonia. Or bronchitis. But how do you know? Pneumonia, an infection of the lungs, and bronchitis, an infection of the airways, have similar symptoms. However, the differences are sufficiently distinct for diagnosis and treatment. Signs and symptoms for pneumonia may be mild or severe, affected by various conditions. 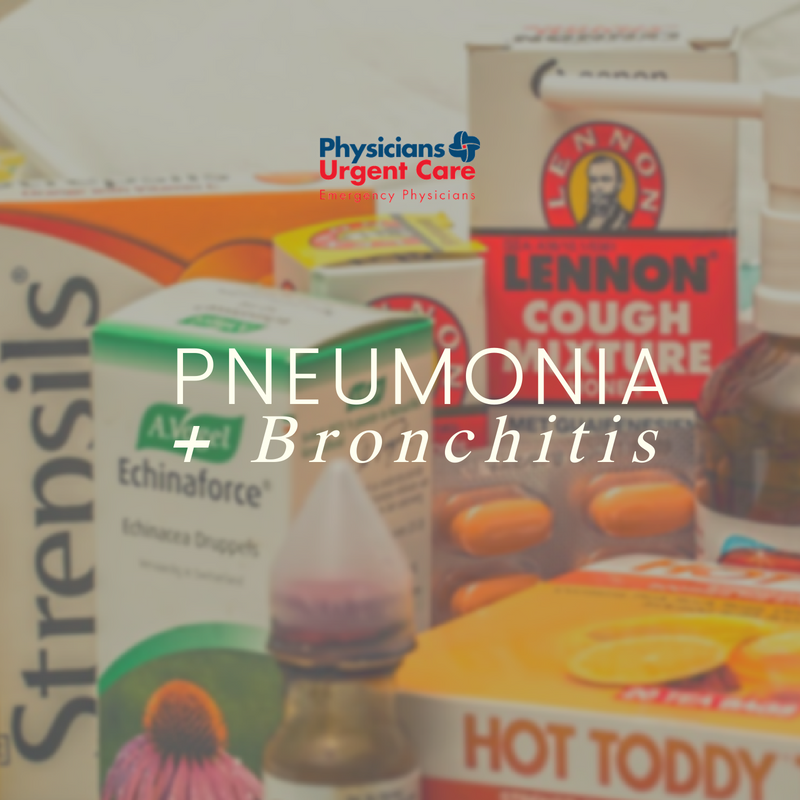 Both bacterial pneumonia and viral pneumonia can become life-threatening, especially when coupled with age or overall ill health. Pneumonia usually comes on quickly with symptoms. The symptoms are cough and irritated throat, fever and chills, aching muscles and fatigue, and fast, shallow breathing. Symptoms may also include nausea, vomiting, and diarrhea. Children generally experience symptoms similar to adults. But in adults over the age of 65, the symptoms exhibited may be milder, or varied, with lower than normal temperature. Pneumonia may present itself as the flu at first. “Walking pneumonia” is associated with milder symptoms similar to a cold, but lasting longer and is usually diagnosed in young adults. Bronchitis symptoms include cough (“wet” or “dry”), mild fever and chills, chest discomfort, and fatigue. The inflammation and narrowing of the air passages from the nose to the lungs causes difficulty in breathing, and often develops after a cold. The cough may last weeks, or even months. If shortness of breath worsens, your cough produces blood, your fever is persistent and high, or your skin or nails become gray, seek treatment immediately. Complications can quickly become dangerous. Tests will be done to diagnose your illness. After receiving treatment, don’t rush your recovery. Rest, be certain to take the prescribed medications to completion, and drink plenty of hydrating fluids.